With air-inclusive packages on Canada’s largest flight network, the world is your oyster. Travel to luxurious destinations around the world including the Caribbean, Mexico, Europe, USA and Canada, while earning Aeroplan® Miles with most packages. Experience award-winning hospitality, friendly customer service, and peace of mind on your next getaway with Air Canada Vacations. Need expert advice for your next getaway? Our experts are here to be your personal Air Canada Vacations agent. We can help you with everything - flights, airport and hotel transfers, hotels, cultural excursions, recreational day trips, rail passes, and more, to send you on the vacation you’ve always dreamed of! Bring the whole family on vacation! The Family Collection showcases resorts offering something for everyone, especially the youngsters. Dedicated kids’ pools, supervised kids clubs, and plenty of discounts and savings for your kids, the Family Collection puts you and your little ones first. From Disney vacations to Atlantis adventures, these Air Canada Vacations packages designed especially for your family will leave you with memories to last a lifetime. Perfect if you’re planning a wedding, a honeymoon, a romantic weekend away, or time off with some of your closest friends. 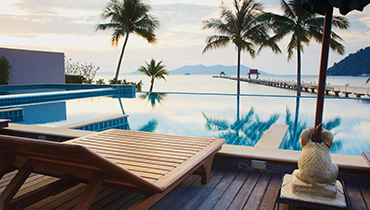 Enjoy peace and tranquility on a beach, sip on a cocktail or two, spend a day indulging in spa services. Have all the grown-up fun you can have at these resorts, reserved exclusively for guests ages 18+. Only the best. It’s all about gourmet dining, 24-hour room service, world class amenities and a level of elegance only these deluxe properties can offer. Live luxuriously in your home away from home, toast to the good life, and bask in the finest of the fine with the Luxe Collection. Immerse yourself in resorts that take special care of your well-being with enriching activities like yoga and meditation, spa facilities, and fully equipped gyms. Treat yourself to a variety of services like aromatherapy, massage, facial treatments, and more. Relax your mind, body, and spirit with the tranquil escapes of the Spa Collection. ®Air Canada Vacations is a registered trademark of Air Canada, used under license by Touram Limited Partnership, 1440 St. Catherine W., Suite 600, Montreal, QC.